My name is Lee Weems. I've spent most of my life in GA, but I did live in Tulsa as a boy and love getting back to OK. 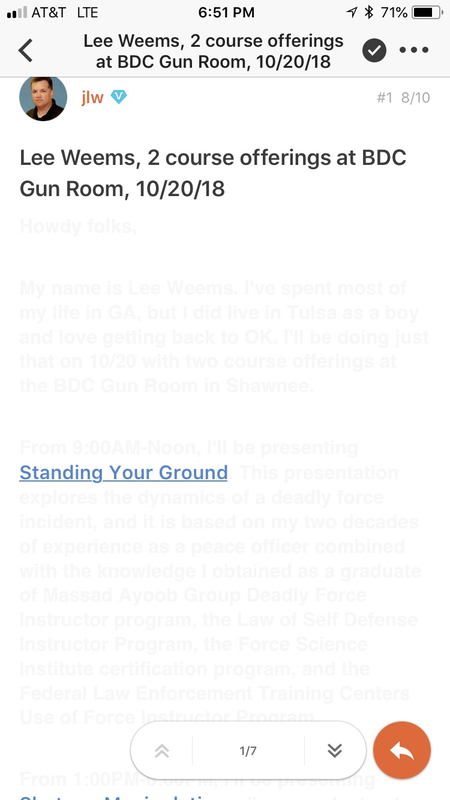 I'll be doing just that on 10/20 with two course offerings at the BDC Gun Room in Shawnee. From 9:00AM-Noon, I'll be presenting Standing Your Ground. This presentation explores the dynamics of a deadly force incident, and it is based on my two decades of experience as a peace officer combined with the knowledge I obtained as a graduate of Massad Ayoob Group Deadly Force Instructor program, the Law of Self Defense Instructor Program, the Force Science Institute certification program, and the Federal Law Enforcement Training Centers Use of Force Instructor Program. From 1:00PM-6:00PM, I'll be presenting Shotgun Manipulations. I'm a graduate of the FBI's Police Firearms and Law Enforcement Instructor programs, the Rangemaster (Tom Givens) Defensive Shotgun Instructor course, the Georgia Public Safety Training Center Shotgun Instructor course and numerous others. The Standing Your Ground class is $50. The Shotgun Manipulations class is $120 and covers both tuition and range fees. You can attend both classes for $150 by purchasing a combo ticket on the Shotgun Manipulations page. More information is available at the above links. I can be reached at lee@firstpersonsafety.com. Darn it Lee! I will be out of town this weekend. Maybe I can catch you down the road somewhere. This should be a great course. Shotgun gun is hard to come by! Sorry we’ll miss you. Hopefully the turnout will be good for this class and the interest will be there for more. Let's hope your back cooperates. We are little less than a month out. We have plenty of room. In fact, we (really just the one person who has signed up and me) might have an echo. I think something is wrong with the post. The info can’t be seen. Are you by chance viewing the forum via Tappatalk? It's showing fin on my computer, but when I look it on my phone, it appears just as your screenshot. The response has not been encouraging. We have only one student signed up so far If you are planning on attending, please either sign up or let me know ASAP. Unfortunately, we didn't get enough students for this one to go. We may try again in the summer.